Understanding the applications and benefits of technology in the classroom. 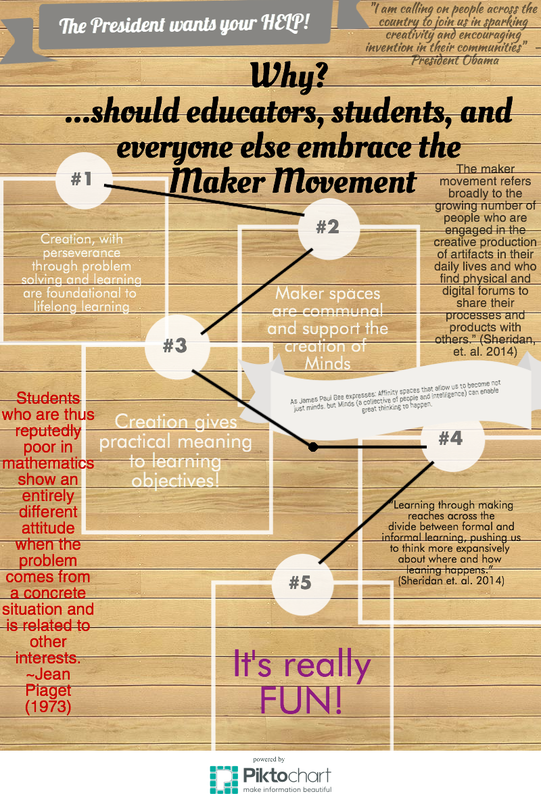 This week in my CEP 811 course we were tasked with creating an infographic focused on #MakerEd, in other words, an aspect of Maker Education. I focused my infographic on reasons why individuals, specifically educators and more specifically math educators should use maker education as a part of their curriculum and everyday lives. The infographic leads you through some of the most important reasons, I believe, and research backs, maker education. In order to not clutter the graphic the references used to create the graphic are listed below. If image is too small read, click on the image and it will enlarge. Enjoy and good luck making. Davis, V. (2014, July 18). How the Maker Movement is Moving into Classrooms. Retrieved April 18, 2015. Gee, J. (2013). The anti-education era: Creating smarter students through digital learning. Palgrave Macmillan Trade. This work by Todd Boynton is licensed under a Creative Commons Attribution-NonCommercial 4.0 International License.